Are you in need of a small SUV that has the ability to tackle a variety of jobs, but still save you money on fuel? If head over to Lumberton Honda in Lumberton, NC and check out the 2016 Honda HR-V. Our dealership has served Fayetteville and Wilmington, NC for a number of years with an amazing selection of new Hondas in stock. 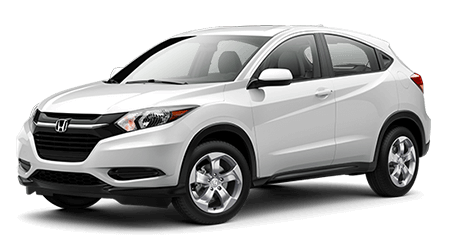 Stop by Lumberton Honda at 301 Wintergreen Dr. and explore the new HR-V.
For 2016, the HR-V is a brand new vehicle for Honda. The compact SUV utilizes the same frame as the Honda Fit, which gives it a usable and versatile size for everyday use. With the same engine as the Honda Civic underneath its hood, the HR-V is also capable of saving you money on fuel. The new HR-V takes the compact SUV segment to another level of versatility. Unlike other compact SUVs on the market today, the new HR-V has a punchy motor that shines in a variety of driving situations. The HR-V is equipped with a 1.8L inline-four that makes 141 hp and 127 lb-ft of torque. The engine is paired with a six-speed manual transmission as standard or an optional Continuously Variable Transmission (CVT). When properly equipped, the HR-V can return 28/35 mpg (city/hwy). For a compact SUV that can complete all of your driving tasks and save you money on fuel, the 2016 Honda HR-V is the vehicle for you. For an excellent price on a new Honda, visit Lumberton Honda in Lumberton, NC. We’re proud to be one of the state’s premier Honda dealerships and will provide you with an enjoyable experience. Come by our dealership at 301 Wintergreen Dr. and discover the new HR-V.
*25 city/34 highway/28 combined mpg rating for 6MT models. 28 city/35 highway/31 combined mpg rating for 2WD CVT models. 27 city/32 highway/29 combined mpg rating for AWD CVT models. Based on 2016 EPA mileage ratings. Use for comparison purposes only. Your mileage will vary depending on how you drive and maintain your vehicle, driving conditions and other factors.